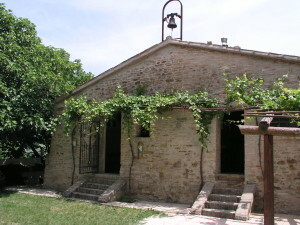 The small church of Sant’Apollinare, Mondaino (Rimini). This place of worship is one of the most ancient of the territory and dating back to VII-VIII century A.D. The church pays homage to Sant’Apollinare, bishop and martyr of the III century A.D. Thanks to its location between Romagna territory and Rome through the Furlo Pass, this church like other sacred buildings has been a spot of refuge and refreshment for the pilgrims walking to San Pietro.